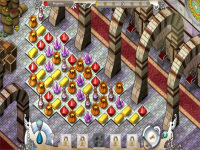 Citadel Arcanes is a kind of match 3 game featuring glistening graphics and animation. Mix all stones with various shapes and make at least 3 similar objects lined up horizontal or vertically. Citadel Arcanes provides quest mode and arcade mode for free. Each contains many challenging levels for your fun. Solve the first level to unlock the next levels.